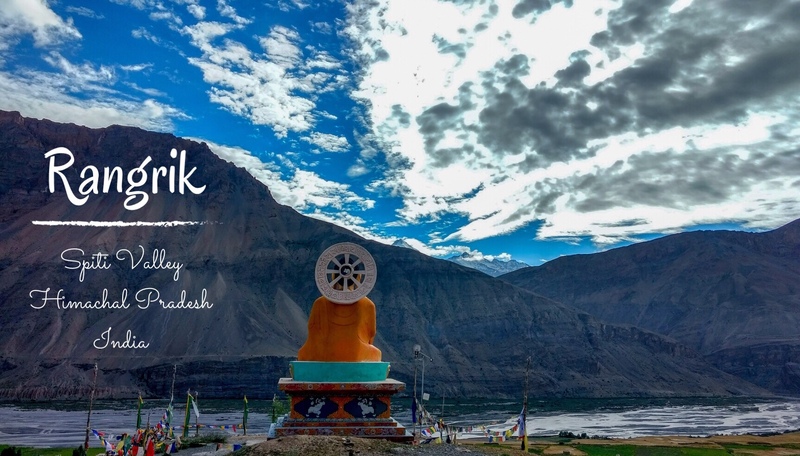 Our three nights of stay near Kaza was at Rangrik, a small village 7-8 Kilometers away from the main Kaza market. Kaza is the common point to access Pin valley, Mudh, Langza, Hikkim, Komic and Ki monastery, all located around Kaza. We spent early mornings exploring Rangrik, and left at around 9 or 10 am for the day trip to Mudh-Pin Valley, Langza-Hikkim-Komic and Ki-Gette-Kibber. We returned to Kaza each evening and spent time at the bustling market or lounged at the Himalayan café. At an altitude of around 3700 meters, the village is located on a plain valley around which land rose into multiple folds, thousands of feet high. We had settled in a snug room framed by wood on all sides with a low bed stationed in the centre. I woke up to the melodious chirps of a tiny featured visitor that made me conscious of the spectacular view outside my window. It would be appalling if I didn’t go outside! So we decided to hike to a Chorten on the mountain, that didn’t appear too far from our hotel. Grey clouds coated the sky densely, which meant it would be chilly. I snuck into my fleece parka and took off. We simply climbed onto the first gradient that came our way and meandered through the mountains. As we delved deeper amidst the dry land, there stood a large reservoir of water, shimmering from the glints of sunlight hiding behind the clouds. Upon crossing it, I reached the edge of that mountain only to find more mountains soaring higher and spreading far. Right at the bottom was a grey stream, winding along its path shielded by mountains on either side. As we ambled along, I spotted pretty flowers in blue which almost had me thinking I had bumped into the Tibetan Blue poppy! After hiking for another 10 mins, we finally reached the Chorten we came out looking for. It was neither grand nor special but it was the endpoint of our peregrination for now, and that’s what made it beautiful. Having spent some time there, we got off the mountain and found ourselves 3 Kms away from the village. The next morning we planned a longer hike to a large statue of Lord Buddha that was visible on the way to Rangrik. This time we went into the village and asked the locals for directions to get to the statue. It was from behind the village school, over a narrow ledge adjacent to a long water-filled trench. After maneuvering our feet on the tapered path, we found two trails going to the statue. I took the longer one which didn’t go straight across the hill with loose gravel on it, making it slippery. Lord Buddha sat meditating on a large flagstone facing the rising sun, surrounded by multicoloured prayer flags fluttering to disperse the sanctity emanating from his halcyon posture against a background of a blue sky covered with white ambiguous freckles. As the wind nuzzled my face, I stood spellbound by the enchanted landscape. After spending around half an hour there we headed back the same way we got there. There were one or two more routes to get there and some of them are hard to climb, although the locals move around the hills with a lot of ease. • Visit the Kaza market. You can either just visit or shop. • The best way to get here is a private vehicle. • Weather in the Himalayas is unpredictable. Dress in layers to be comfortable. • There’s no mobile network AT ALL except for BSNL connections that work here. • Homely food is served in the hotel. Very sparse eateries here. • Don’t forget to carry water with you here for hikes or long walks.